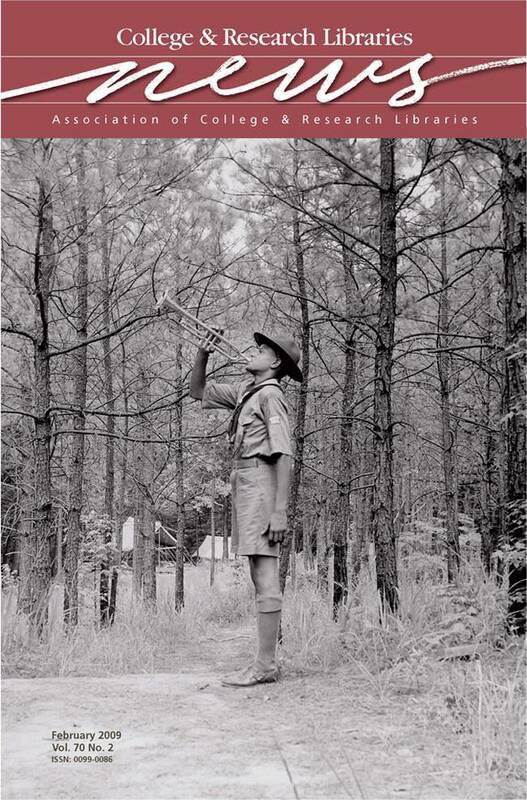 This month’s cover image depicts a boy scout playing a bugle at Camp J. K. Orr, Lovejoy, Georgia, circa 1940. Around this time, Camp Orr was created for the scouts of District Ten of the Atlanta Area Council of the Boy Scouts of America. Established in 1931, District Ten served the needs of Atlanta’s African American male youth. This photograph is from a scrapbook in the Edward Randolph Carter and Andrew Jackson Lewis Collection, held in the Archives Division of the Auburn Avenue Research Library on African American Culture and History (AARL). AARL, a special library of the Atlanta-Fulton Public Library System, is dedicated to preserving African American heritage by providing a home to manuscripts, photographs, oral histories, books, periodicals, and works of art. Visit AARL at www.afpls.org/aarl.